The Community Plate would like to introduce its first Guest Blogger! Everyone say hello to Megan! Megan and I have been neighbors since 2002, when my parents built a house right next to her parents. Megan's sister, Courtney, and I graduated together (Shoutout!! Kingsway Class of '05) and, despite living in separate states for over 5 years now, we have been best friends since the move, eleven years ago. Recently, I saw Megan had posted something on Facebook about a great recipe she had made, and since Megan is an excellent teacher and extremely talented photographer, something told me she could write a great piece for my blog as well. I've been wanting to have a guest blogger for so long, and I am so glad I finally found one! Thanks, Megan! 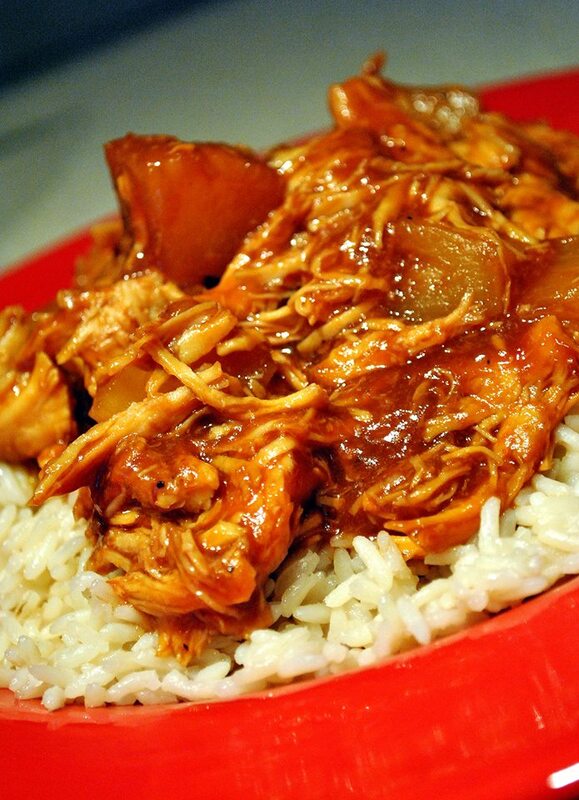 Continue on to read Megan's recipe, "Aloha Chicken & Rice", and try it for dinner tonight! Be sure to let us all know how it is in the comments! Enjoy! I love to cook. But, do I like to clean up the giant mess I make after I make a great recipe? No. But that doesn't stop me from creating them! I'm a big fan of my crock pot. Big. HUGE. However, I have a giant fear of turning it on before work and coming home to an overcooked and gross dinner. So I only use my crock pot on the weekend when I can keep an eye on it. I know, I know...defeats the idea of what a crock pot is intended for. Call me crazy! 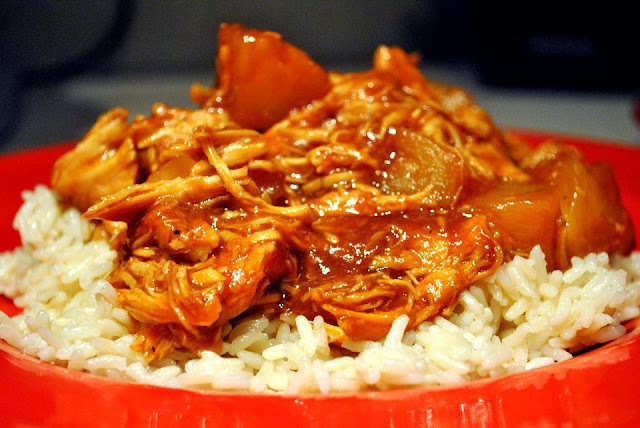 One day I was pinning my afternoon away on Pinterest, and came across this recipe for Hawaiian BBQ Pulled Chicken. And I'm pretty sure I'd like Hawaii, if I ever get there. I changed the recipe I found just a tad. I hate onions so I just cut them out. If you like onions, more power to you. I also used chicken breasts instead of thighs. In all, I added about 2 1/2 pounds of chicken, two drained cans of pineapple chunks and a large Bottle of Sweet Baby Rays BBQ sauce. With the crock pot on LOW, I dumped everything in, mixed it up and walked away. Seriously...I dumped, mixed and walked away. 3 minutes of work. Phew...now I can go back to my DVRed shows! Throughout the day I kept checking on it and would rotate the chicken breasts just to make sure everything was getting evenly cooked. I started around 11am and by 5pm, it looked good to go. 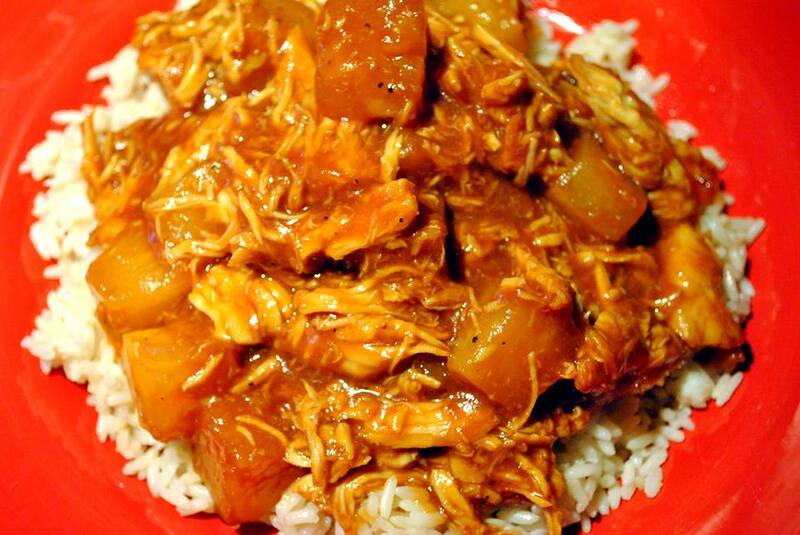 I shredded the chicken using two forks and then put it back into the pot to mix with the sauce and pineapple. In hindsight, I wish I had used a little more chicken. Once it was all shredded, I felt like there wasn't enough "meat". Lesson learned. I made some quick rice and scooped the pulled chicken over the top. Then I put the plate in front of my food picky boyfriend. And I hovered like a parent dropping off their kindergartener for the first time... would he like it? Keel over? Give me that grin and say, "this is awesome, babe" and then suffer his way through dinner? Well, he ate the entire plate. The WHOLE thing. He may have been lying that he really liked it, but I definitely enjoyed my own plate! I would be curious to see how this tastes on a roll as a pulled chicken sandwich. I would suggest that if you're doing a sandwich instead of rice, definitely add the extra chicken. Otherwise, that'll be one messy sandwich! This recipe makes a lot. I fed myself, the picky boyfriend, and gave a to-go container to a neighbor. And now, I still have a container of leftovers in the fridge. I'm sure it's easy to cut this in half or best judge for what you need. Any questions? Leave them here in the comments section! "Dump" all ingredients in your crockpot. Cook on low for 5 hours. Remove chicken and shred to your liking (big chunks, small chunks, fancy shred, etc.). 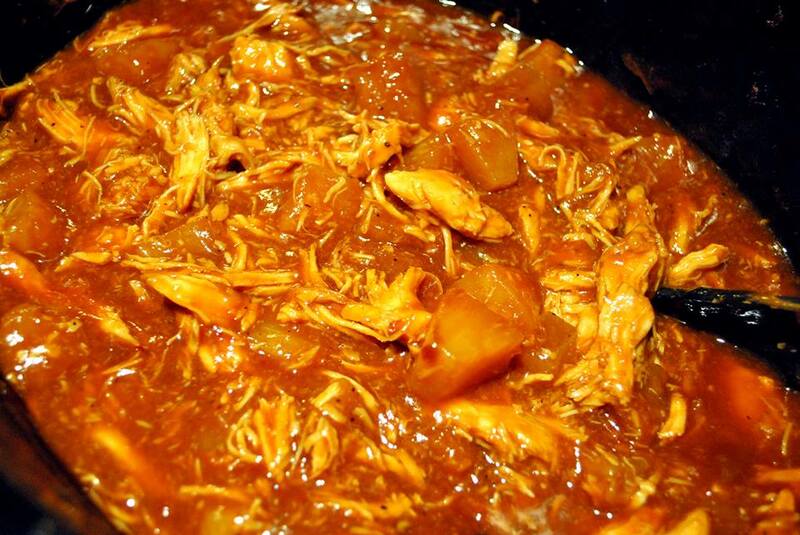 Insert chicken back into crockpot for another 1 hour to let it "soak" in all the glory and flavor. Remove from crockpot and serve over rice, on a roll, or all by itself! Enjoy!